This collection represents an engagement with American history, technology, and cultures. 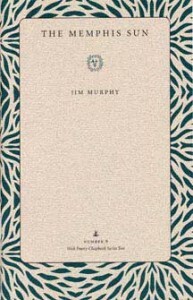 Murphy’s poetry ranges from fairly straightforward narrations of events to experimental pieces using a variety of American-speaking subjects and several angles of vision on cultural creations—Elvis Presley, Holly Golightly, and Elmore James, to name just a few. Formal choices include the interlocking movements of the sestina and the rondau, the ebb and flow of loose blank verse, and the syncopated variety of free verse.